Sumatra. I just like saying the word. I like the way it rolls off the tongue; at once sounding mysterious, dark and exotic, igniting the imagination and stirring up all of the things that have driven me to travel to distant edges of the earth, that have inspired me to lift up the corners of the carpet in unknown lands to see what’s underneath. After more than four months of backpacking, I’m often asked what my favorite places have been. One that always comes to mind is a small, rustic town on the banks of the Bahorok River in Northern Sumatra. A little place called Bukit Lawang. 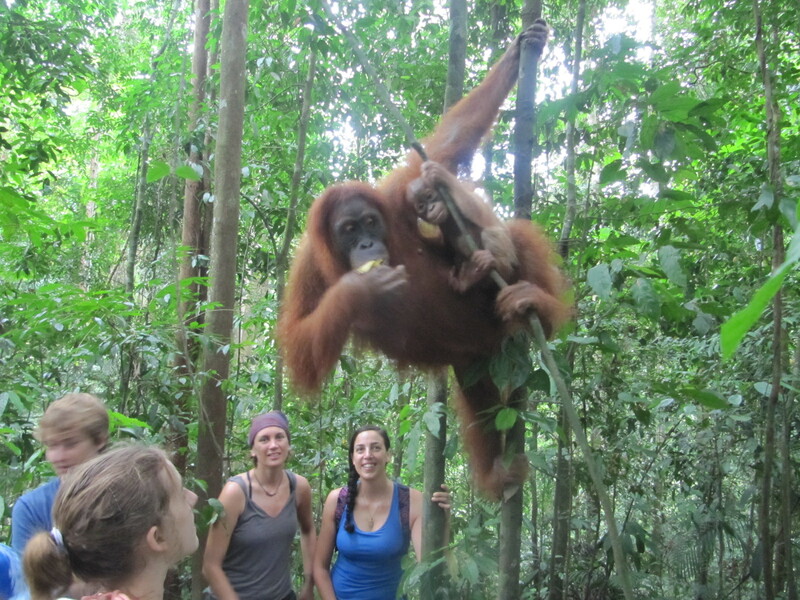 We heard of this town because it’s one of only three places on the earth where you can see orangutans in the wild. We came for the apes, but what we found was a friendly, happy, little village like no other, that in a matter of hours felt like home. The friendly riverside town of Bukit Lawang. We arrived in the ‘bus station,’ which was really just a dirt lot with a few cars and vans, and made our way into town. Most of the accommodation in Bukit Lawang consists of little wooden and bamboo bungalows located on the far side of the river. The river splits the town in half, and three footbridges provide the only means to get across — each more rickety than the next. The shaky Indiana-Jones-like bridges only add to the town’s charm. All day long, there are children laughing and playing on the riverbanks and riding in tubes down the fairly fast current. There are many outfits in town that organize one, two or three day trekking expeditions into the jungle to search for orangutans, gibbons, some smaller monkeys, birds and other wildlife while clambering up and down steep hills in a dense forest. Our guide, Edwin, spoke good English and was very friendly and fun. And as we were hoping, we saw a ton of orangutans. A mother and baby orangutan are close enough to touch… though you shouldn’t do that. No no. Never touch an ape in the wild. Some of the orangutans in the Gunung Leuser National Park are “half-wild,” we were told, meaning that they lived in the Orangutan Rehabilitation center for a period of time and then were released back into the wild. So these apes are not afraid of getting close to people, they will swoop right down from the tree branches and grab a banana out of your hand. They will climb down and pose a few feet above your head, making for great photos. The few fully wild orangutans would stay high in the tree branches, keeping their distance from the gawking people below. The faces of orangutans are so expressive and almost creepily human-like. Orangutans move slowly and deliberately through the trees and make a lot of noise, so you can hear one rustling in the leaves before you will see it. I found the gibbons to be just as cool to watch as the orangutans, too. They move so fast and stealthily through the trees — blink and you’ll miss one fly by. 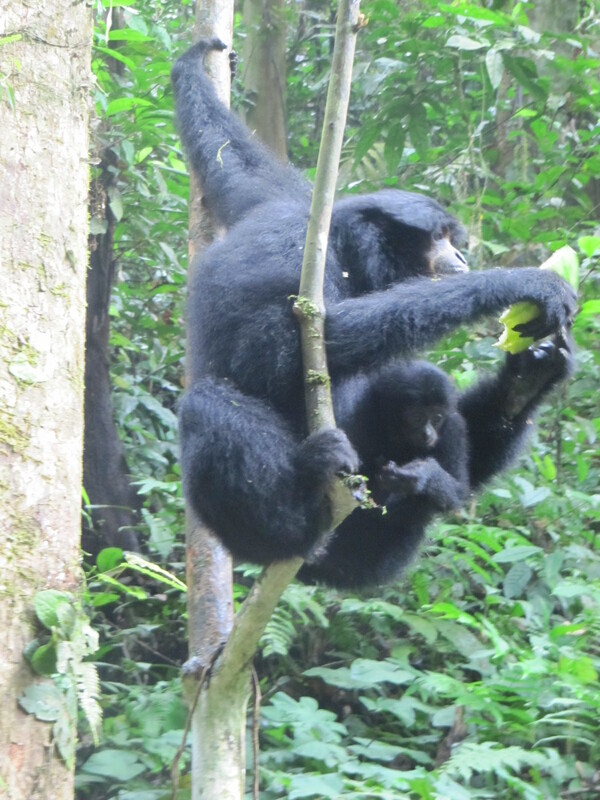 A mama Siamang, with her youngin. Siamang is the largest of the Gibbons. Though an average orangutan’s got a good 80 pounds on a gibbon, a gibbon would win in a fight. (We asked our guide, of course.) Gibbons are much faster, and quicker to attack. Edwin had even witnessed a fight before, he said, probably over territory. At the end of our long full-day trek, we descended down to the river for a little rafting adventure. The other big activity in town is tubing down the river, and it is a great time! The guides will tie a bunch of big tubes together, creating a makeshift raft, and steer with a long stick as you float down the river back to town. The water was on the low-side for us, but we did hit some small rapids. This was the most fun part of the day for me. Unfortunately, I don’t have any photos because our cameras were wrapped up in waterproof bags with the rest of our stuff. We also opted to go on a half-day trip to an elephant camp, where for just $10 each we got to play with the elephants, wash them in the river, and feed them. 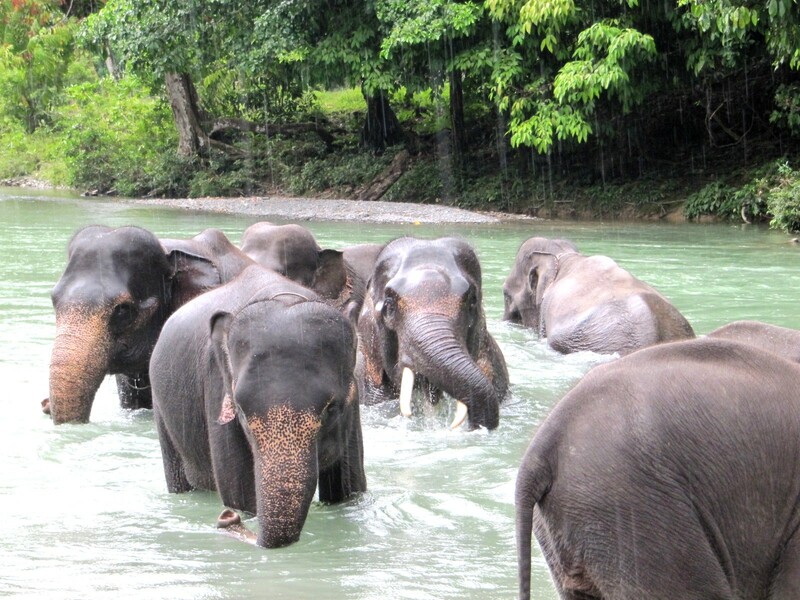 Elephants take a dip before their bathtime. It’s about a two hour bus journey from BL through some beautiful scenery, but there is no paved road for most of way, so get ready for a bumpy ride. There is some controversy about elephant tourism throughout Southeast Asia — for example in Southern Thailand, some people have found that elephants are kept in bad conditions, are overworked and are even beaten by their handlers. This elephant camp seemed really great and the staff treated the elephants well. There were about a dozen tourists in our group, and we followed along as 7-8 elephants of all sizes were paraded down to the river for bath time. It was great to watch the big animals swim and splash around in the water. We broke up into groups and each got an elephant to hand wash with a big brush. Pretty luxurious treatment for these elephants, I think… we were also told to massage them and scrub their toenails. The elephants were very playful and followed the directions of their handlers, even spraying us with water from their trunks, and blowing air in our ears when we weren’t looking. Olive the elephant gets a day at the spa. Mani, pedi, massage and body scrub. I think she gets this everyday, actually. Lucky lady. Things I learned about elephants: The males are very territorial, and only one male can live in a tribe, or there will be trouble. He gets to have like 7-8 girlfriends, and the ladies don’t seem to mind. Elephants love playing in the water. They can take down a whole pineapple in one gulp, with the leaves and all. Their appetites are seemingly insatiable. They know when you have food, and will soon lose interest and move elsewhere if you don’t. They are very intelligent and expressive — by looking at an elephant move her trunk, it is almost like she is talking to you. They like to play, blow water or air at you to get your attention, and make a fake kissing sound with their trunk on your cheek, it’s very cute. We ended up staying at the Indra Valley Inn which really kind of made the trip for us. The young local guys who run this place are so cool and nice, they create a great atmosphere for everyone. The restaurant had some of the best food in town, too. The room itself was very basic. Usually, when you hear a room described as ‘very basic’ in Southeast Asia, it means cold water and a manual flush toilet, and maybe a fan. But at $5 per night, split by three (that’s $1.33 each, yo), we did not mind. Every night, after the sun went down, the guitars and djembes would come out. Everyone in the bar would be coerced to participate in a group sing-along and jam session. The staff has a book of songs and lyrics that they pass around, and guests take turns choosing the next tune. Several Bintangs later, you’ll find that hours have passed as you were engrossed in the nightly 90s alt-rock tribute. This is not the song, it was just a tribute. 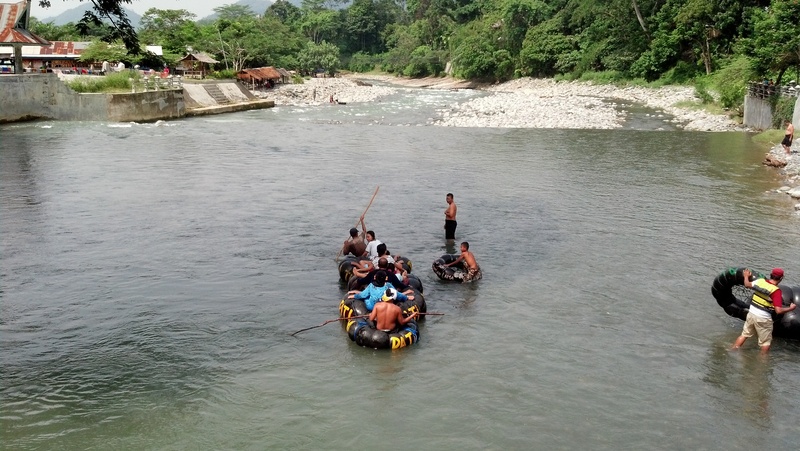 Don’t miss the tubing here in Bukit Lawang. Indonesia has some of the most cheerful, friendly people around. Soon after arriving in BL, we met many nice locals who not only learned our names, but would always say hi and stop to chat as we walked around town. Even three days later, these guys would remember our names. “Hi Jamie, hi Michelle! Where are you going today?” we would hear while shopping or taking a morning stroll. As I also experienced on the small island of Gili Air, the memory of a place a can really be made by the people who live there. This place is special in my heart. I would definitely recommend a few days in Bukit Lawang to anyone traveling around Indonesia, and let me know when you’re going — I’ll go back with you. I loved this “people of the jungle” post!